A small, somewhat eccentric restaurant close to Kelvingrove Park, with an authentically Spanish welcome, and BYOB at £5 corkage for wine, £1.50 for beer. Nestled in one of Glasgow's artist-inhabited colourful side streets, this distinctive café offers BYOB at £3 for wine to go along with the afternoon tea. Flavoursome Egyptian cuisine served in an alluring and authentic Middle-Eastern dining space with great service and an enticing corkage charge of £3.95 for wine and 75p for beer. A rarity in the bar world, this newcomer from the Redmond's of Dennistoun team allow beers and wine bought from the neighbouring off-licence – corkage £1.75 beer, £7.50 wine. This cheerful eatery at St George's Cross dishing up genuine Malaysian-Chinese cuisine, and a no-corkage BYOB policy. The Glasgow branch for the Edinburgh Indian street-food specialists, with small plate dining and a 50p recycling tax on your own booze - no other corkage. Nestled in one of Glasgow’s artist-inhabited colourful side streets, this distinctive and relaxed café offers a contemporary take on afternoon tea. A small, somewhat eccentric restaurant close to Kelvingrove Park, with an authentically Spanish welcome. The team behind Redmonds of Dennistoun branch out to the southside, with a food menu full of delights, cocktails and craft beers. 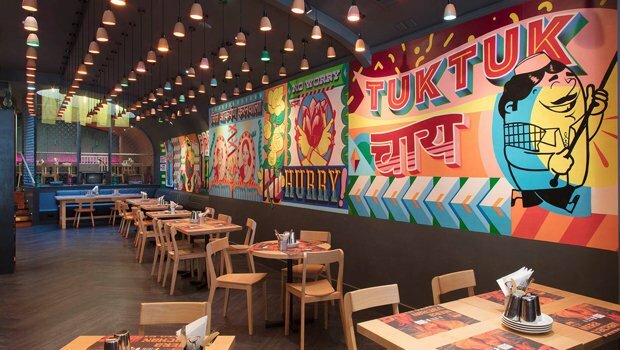 Sauchiehall Street restaurant specialising in street food, tandoor and curry dishes from across the Indian subcontinent in a casual setting.